For creative professionals, lawyers, athletes, chefs, physicists (basically everyone), one of the most commonly thrown around expressions regarding creative thinking is “think outside the box.” To illustrate this point, a simple test was devised to see how well people actually carry out this concept. Perhaps some of you have already seen this, as this is certainly not news. The objective is straight forward. 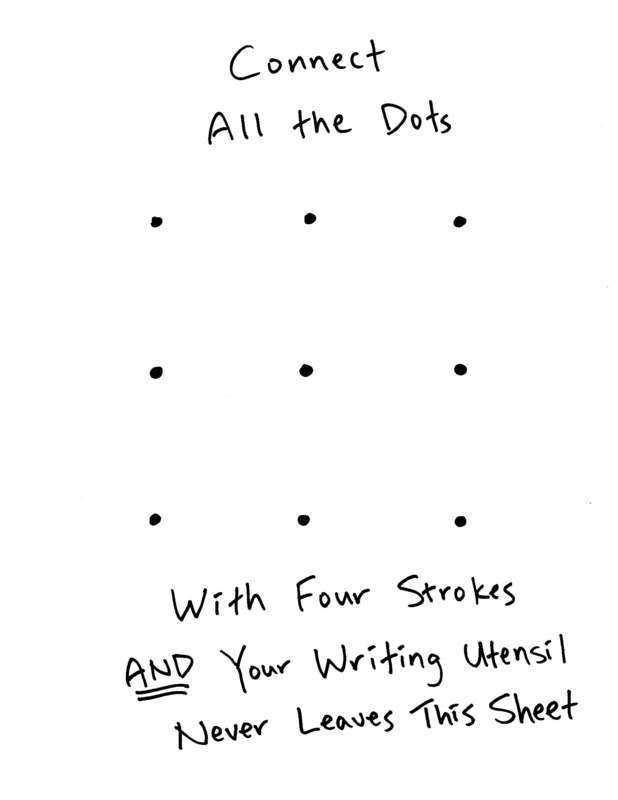 Using only four strokes, connect the nine dots on the page, with your pen never leaving the surface. For those of us that are visually challenged, here is my illustration, aided by my child-like handwriting. In my two-dimensional brain, this was hard. Like a raged bull constantly charging a brick wall at the end of a dead end street, I zigzagged my way across this grid, seemingly lost. The outcome was something like this. The solution is rather simple, revealing a critical assumption – no one said you had to stay within the “boundary” created by the nine dots. Taking that into consideration, here is the answer. “No one said you had to stay within the box.” The illustration above, I hope, is self-explanatory. The expression “think outside the box” sounds very creative, insightful, and is indeed useful. It reminds us to lift our heads out of the gutter, step back, and observe the situation as a whole. It reminds us to not allow the given rules of the situation limit our thought process by throwing up brick walls at every turn. It reminds us that the answer is actually “outside” the box, not within it. This expression, however, is not always accurate. Often, there is no box at all. 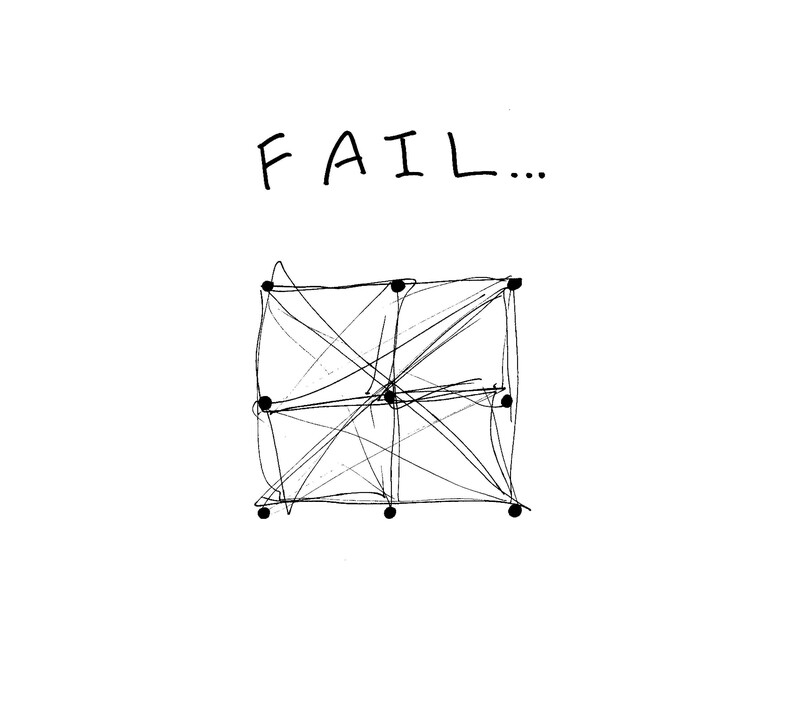 The only alleged box is the imaginary one we perceive, limiting our thought process to such non-existent boundaries. Therefore, the correct expression should be “think like there is no box.” In other words, think like you’re drawing your own boundaries, because there are none to begin with. Problem solving requires one to work with a set of “givens,” meaning there already exists certain pieces to the puzzle that one simply cannot discard. Fair enough. But those pieces themselves are rarely “boundaries” imposed to set the outer limits of one’s proposed solutions. Creativity, unlike problem solving, rarely prescribes a set of givens to work with, so thinking like you’re drawing your own box should be simpler. The dots on a grid do not signify anything; they are mere reference points, mere suggestions, designed to prick the tiniest of holes in a bulging water balloon of ideas. The reference points do the pricking, and the gushing thought process does the rest. 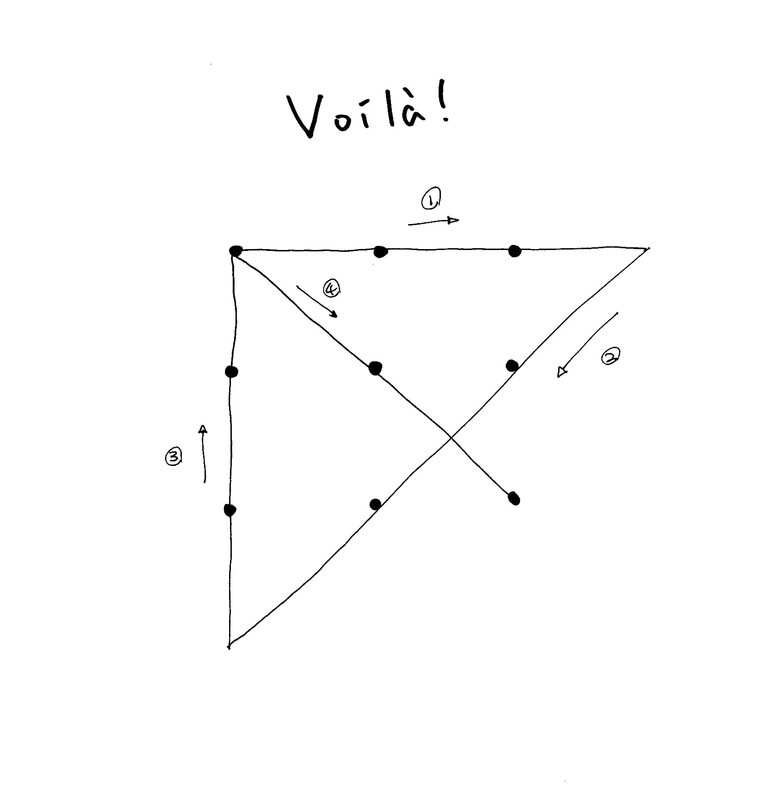 Remember, no one told you to connect the dots within a supposed square outline. But also remember, no one told you to imagine a box in the first place.